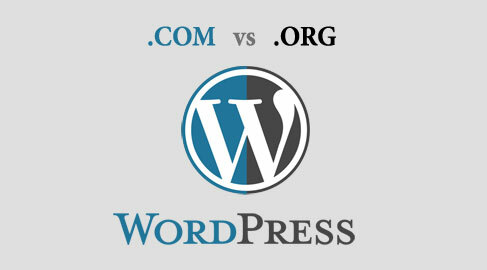 WordPress.org vs WordPress.com | Which one is right for you? So, you are ready to start developing your first WordPress website or blog? And, you just found out that there are two options available for you, wordpress.com and wordpress.org, and you have no clue which one is the right solution for you… Don’t worry, after reading this article, you will be able to make an informed decision about which one to use. WordPress.com is a hosted solution, which means you do NOT need to register for a hosting account, or run any installation of the WordPress software on the server yourself. Everything is ready for you to get started, and you can have your blog and a website ready in a few minutes. But, it comes with a number of limitations which I will discuss in this article in more depth. WordPress.org, on the other hand, allows you to download the full WordPress software and install it on your own server. With WordPress .org, you need to register for your own hosting plan with a provider of your choice, and run the installation on the server yourself (although, this may sound intimidating, most hosting companies today offer 1-click install directly from your server’s admin panel). WordPress.org has absolutely no limitation of what you can do with it. We will now go into discussing all the differences between .COM and .ORG in more depth. 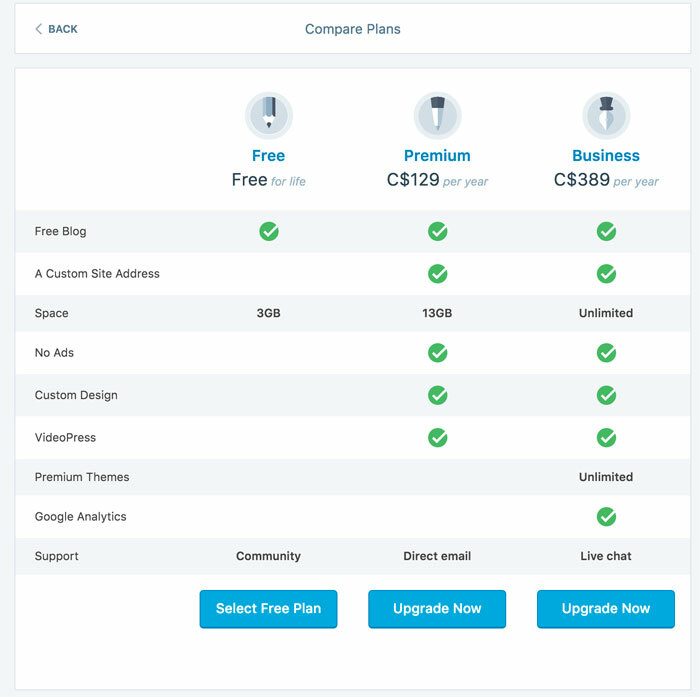 Unlike WordPress.org, the .COM version is a hosted version which will require you to pay for most of the upgrades. This chart displays the breakdown of .COM plans. WordPress.com has a pre-set selection of themes available that you can use for your website / blog, both FREE and premium (some premium versions cost over $200!!!). You cannot install any third-party premium themes that you may have purchased from other websites. This is, in my opinion, one of the biggest limitations of WordPress.com and the main reason why I would always recommend going with the “.ORG” option. The selection of plugins on WordPress.com is also extremely limited, and only available with one of their premium plans, so if you require a very specific functionality for your website that does not come natively with WordPress core, I would strongly recommend researching whether those options are available on the “.COM” platform. WordPress.org option, however, is limitless. You can install absolutely any third party theme or plugin that is compatible with the version of the WordPress you are running. You can customize anything, including writing custom CSS code (styling), and editing core PHP files that are powering the WordPress website. There are 1000s of themes and plugins readily available for the “.ORG” self-hosted WordPress platform and almost limitless number of opportunities to extend and power-up your website/blog. However, please make sure that you back up your website files and database prior to installing third party plugins as there have been cases of plugins not being compatible withe some themes and causing issues on some people’s websites. WordPress core software, themes and plugins are continuously updated and new versions are released on a regular basis. It is crucial to keep WordPress software up-to-date to ensure security and protection of your website. WordPress.COM will automatically update your website and you will never have to worry about that. WordPress.ORG, however, is a self-hosted option, residing on your server, and will require your regular maintenance and updates. Don’t let that scare you, though, it is extremely easy to keep your WordPress.ORG website up-to-date via your admin panel. You are notified when new updates are available, and just like your computer’s operating system, you click on a button and let the system do its job updating itself… Easy. But, I STRONGLY recommend making a backup of your website and database prior to running updates, just in case — better be safe than sorry. WordPress.com does NOT support installation of the WordPress’s most popular e-commerce plugins such as WooCommerce. If you wish to sell products on your website, and require an e-commerce integration (products and stock management/shopping cart, etc…), your only option is WordPress.ORG. Hosting FREE hosted solution, ready in minutes. Requires setting up your own hosting plan. Can be set up in about 30 to 60mins, depending on the hosting provider. Domain Name US$29 per year for a custom domain or FREE “yourusername.wordpress.com” You must register your own domain name. If you would like to learn more about WordPress, everything from setting up your WP-optimized hosting server and domain name to advanced lessons like this one, please check out our Online WordPress Workshop where we help you launch our online business with WordPress in just TWO DAYS!